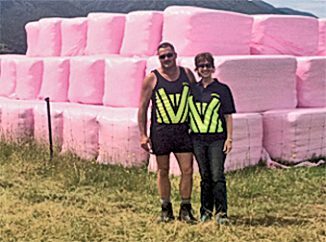 Agpac, the sponsoring company, sold all 3000 kilometres of pink wrap to farmers across the country and a portion of the sales was donated to the charity involved with supporting women, Sweet Louise. Chief Executive Officer of Sweet Louise, Fiona Hatton, says “A secondary breast cancer diagnosis has a devastating impact on members, their families and friends. We receive no government funding and rely 100% on donations.